African migrant labourers have gone on strike in Italy in protest at their poor working conditions, after 16 workers died in road crashes. Shouting "we are not slaves", farm workers downed tools and marched on the city of Foggia in southern Italy. The strike comes after 16 migrants died in two separate accidents in 48 hours. In both cases, lorries carrying tomatoes collided with vans carrying the labourers home after their day's work. Four workers died in a crash in the Puglia region on Saturday, and 12 more perished in a head-on collision near Lesina north of Foggia two days later. The labourers say recruiters who may be linked to organised crime drive them from farm to farm in overcrowded vans, and fail to give them work contracts. 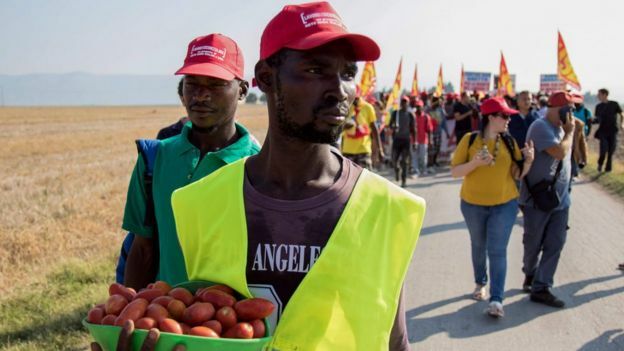 A "red hat march" was announced by farm workers on Saturday - echoing the hats worn by tomato pickers in the fields around Foggia. Thousands of migrant labourers come to Italy in the summer, earning as little as one euro (£0.90; $1.15) for picking 100kg (221lb) of tomatoes. Most of them have regular papers, but they are usually paid below the legal wage. Many are forced to live in shanty towns without electricity or water. Ibrahim Sissoko told Reuters that they are "treated like slaves" in the unregulated industry. "There is no other work here for us and they know it, so they take advantage," he said. 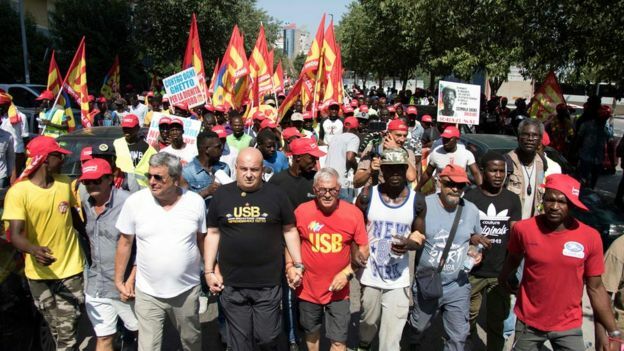 Unions have previously argued for a public transport system around Foggia during the busy summer period to help migrants, and their members joined the migrants' march on Wednesday. Governor Michele Emiliano of Puglia also joined the march, and said in a tweet that the demonstrators are fighting for "the dignity of work". More than 650,000 migrants - mostly from sub-Saharan Africa - have come ashore in Italy since 2014, stretching resources in regions already struggling with high unemployment.